The owners of CN Brown Company recognize the demand for alternative heating products, subsequently in 2010 the wood pellet venture began. 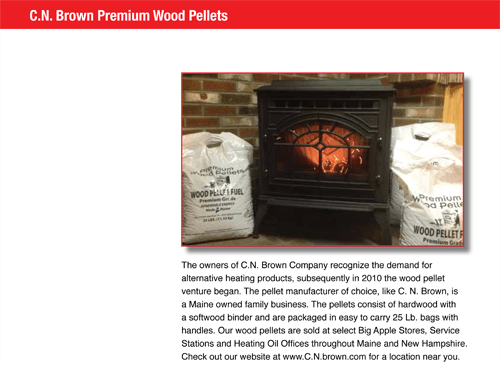 The pellet manufacturer of choice, like CN Brown Company, is a Maine owned family business. The premium pellets consist of hardwood with a softwood binder. They are packaged in easy to carry 25 lb. bags with handles. Wood pellets are sold at select Big Apple Stores, Service Stations and Heating Oil Offices throughout Maine and New Hampshire. Check out our website at cnbrown.com for a location near you. 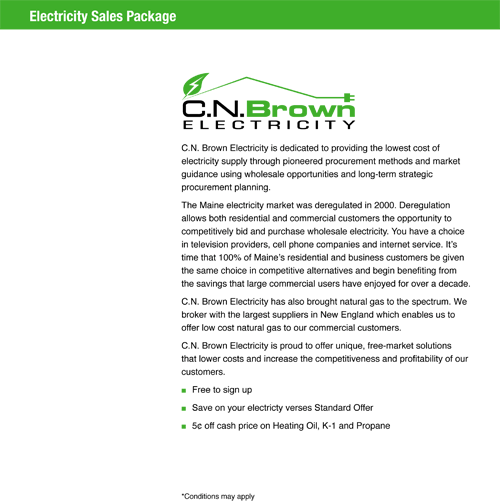 CN Brown Electricity is dedicated to providing the lowest cost of electricity supply through pioneered procurement methods and market guidance using wholesale opportunities and long-term strategic procurement planning. The Maine electricity market was deregulated in 2000. Deregulation allows both residential and commercial customers the opportunity to competitively bid and purchase wholesale electricity. You have a choice in television providers, cell phone companies and internet service. It’s time that 100% of Maine’s residential and business customers be given the same choice in competitive alternatives and begin benefiting from the savings that large commercial users have enjoyed for over a decade. CN Brown Electricity has also brought natural gas to the spectrum. We broker with the largest suppliers in New England which enables us to offer low cost natural gas to our commercial customers. CN Brown Electricity is proud to offer unique, free-market solutions that lower costs and increase the competitiveness and profitability of our customers.